I am in the process of installing two Rachio 16 zone Gen2 controllers. It was only after I ordered them that I discovered that I have to purchase two additional parts - Isolators - at an additional cost of $45 each plus shipping. I called Rachio support to ask what other - more available and less expensive - device could replace the Isolators, but I was told that they could not recommend anything else. I seriously doubt that the Isolator is the only solution to connect two irrigation controllers to a common master valve. Does anyone else have other solutions - like maybe using diodes, rectifiers or relays? I don’t have a lot of electrical knowledge, but I know that there have to be other possible solutions. I did read that a single pole, single throw relay would accomplish the same result. Can anyone provide any other suggestions - so I don’t have to spent another $100 on the Isolators and wait 1-2 weeks for delivery? I seriously doubt that the Isolator is the only solution to connect two irrigation controllers to a common master valve. 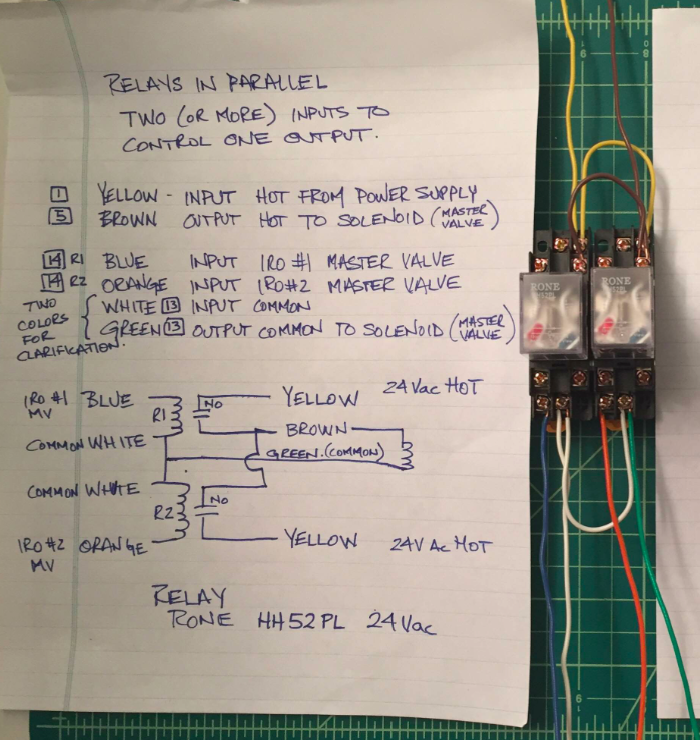 Does anyone else have other solutions - like maybe using diodes, rectifiers or relays? @bruceatxpo, good evening. We use to recommend using relays (and a list of other components), but most users had trouble sourcing the multiple parts and/or completing the advanced wiring required. As such, we only recommend using Isolators or hiring an electrician for this level of wiring. I’ll defer to other users here to recommend alternative solutions and will email you a copy of relay wiring guide via support for your review. I’d love to know if anyone else has any recommendations for this type of installation. Thank you Emil. I would appreciate if you will email me the material information and wiring diagram that you used to recommend. Once I look at it, maybe I will buy the Isolators anyway - but probably not. This seems like a good opportunity for Rachio to have an add-on product - to replace the Isolator with its own device. I would appreciate if you will email me the material information and wiring diagram that you used to recommend. @bruceatxpo, apologies for the delay in getting these to you. Below is the old wiring diagram we use to reference, as well as a user’s wiring recommendation. This seems like a good opportunity for Rachio to have an add-on product - to replace the Isolator with its own device. Another solution is to us a larger transformer size, and thus be able to implement just one transformer. I believe the transformers used by Rachio are the standard 24 VAC 40 VA (watts) transformers that are used for multiple applications including HVAC. If instead a 24 VAC 80 VA transformer is installed, then this is large enough to run two valves simultaneously. Now the wiring can be changed to return to a standard ‘one return line’ for up to 32 zones. At first this appears as a nicely elegant solution. The problem is that 24 VAC 80 VA transformers haven’t in the past been available as a nicely packaged, UL Listed, with internal fusing, etc, like the 40 VA transformers are. They’re often times not UL Listed, not with a nice plastic case, not available until you go up to sizes like 300 VA, and/or don’t typically have internal fusing. If you choose this option, make sure the 80 VA or more transformer chosen is at least UL Listed. As this will reduce chances of fire. Another option is to change the wiring. So that each 16 zone Rachio unit has it’s own 24 VAC 40 VA transformer, it’s own return wire for the valves, etc. This is the most straightforward solution if you can do this. In the lower diagram, it shows the Yellow is Hot from Power Supply. Where does that Yellow come from - since each IRO has its own power supply? Everything else looks straight forward. it shows the Yellow is Hot from Power Supply. Where does that Yellow come from - since each IRO has its own power supply? @bruceatxpo, while the controller’s 24VAC power adaptor could be spliced for this purpose, we recommend using a second 24VAC power supply to avoid any interference. 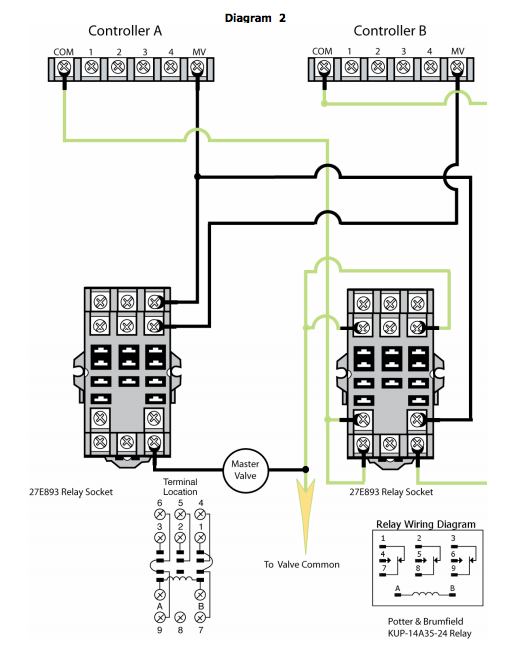 Please note, a single 24VAC transformer can be shared across relays, but one relay must be used for each controller. The Isolator is specially designed to share a solenoid between two or more controllers. A power transformer is not needed with the Isolator, as it uses the power supplied by the controller. Similar to relays, one Isolator must be installed for each controller that is sharing a solenoid. I purchased two of the HH52P relays from Amazon ($8 each) along with a 24 VAC power supply from Amazon ($19). 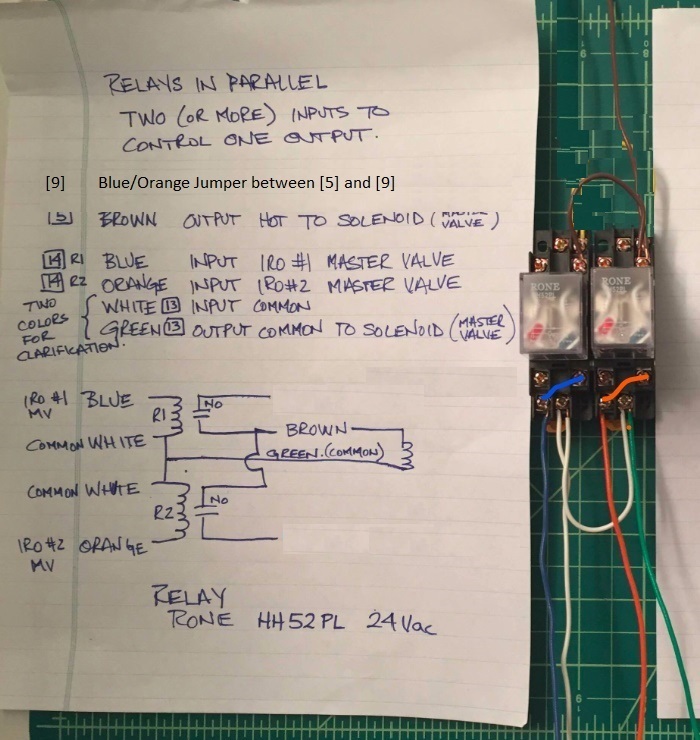 I tried the wiring diagram shown in the photo you posted, but it would not kick off the zones - though it would engage the relay. After looking at the relay, I noticed that pin 5 was the normally open (NO) pin and that - when closed - it connects to pin 9. 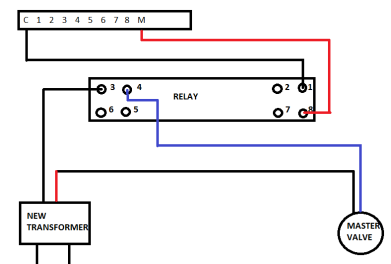 So, I used a jumper between pins 14 and 9 on both relays. I ended up not using the external power supply, because I was not losing hardly any voltage on the output side of the relay. Seems like everything is working properly. I am going to finish testing later today. My installation is not finished out and looks confusing, so, I modified the original image. If I do add the external power supply, I know that one wire will connect like the Yellow wire in the original image. Does the second wire to that power supply connect to the Common on port 13? 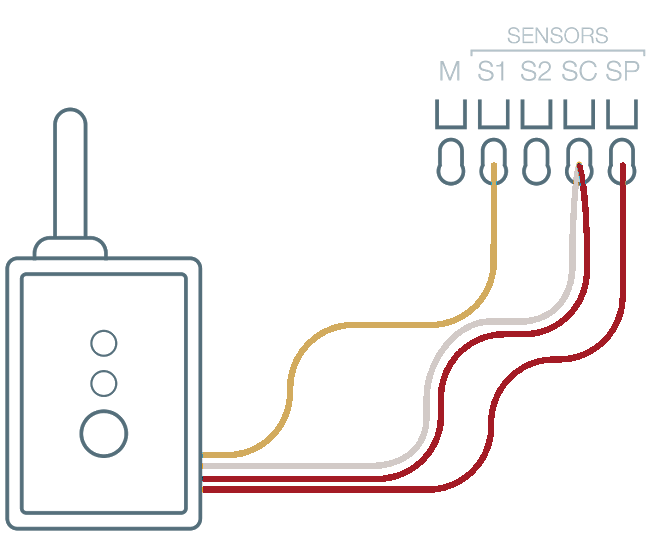 Also, is there a way to share one wireless Orbit rain sensor between both controllers? If I do add the external power supply, I know that one wire will connect like the Yellow wire in the original image. Does the second wire to that power supply connect to the Common on port 13? Also, is there a way to share one wireless Orbit rain sensor between both controllers? Not at this time, but we are exploring ways to do this. I believe some users have wired one rain sensor to multiple controllers as a work around. If you splice into the white and yellow wires (below), it should allow you to send the same information from the rain sensor to both controllers. Remember to activate the rain sensor in the app. Thank you for all of your assistance. I finished setting up the zones last night and everything seems to be happy. I don’t know if there is a way to easily test the sensor to make sure it is working properly on both. I did connect the Yellow & White wires to both controllers and the power wires to just one controller. As for the external power supply for the relays (yellow wire in original photo diagram), since everything is working, I think I will wait and not connect it unless there are any issues. Considering the high cost and slow shipping on the Isolator devices, there is no reason that Rachio Support cannot select a specific relay type (i.e. HH52P) that is readily available on Amazon - then, create supported documentation with a detailed wiring diagram. I spent too much time trying to get all of this information from Rachio - whereas, if it had been easily available, I could have done it in 25% of the time - and at even lower cost.